You will be met by your guide at Istanbul International Airport and transfer to your hotel by private vehicle. Check into your hotel with some time to relax. 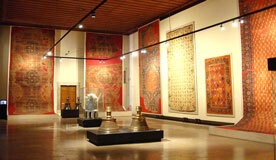 At approximately 2:30 pm, you will start your half-day tour of the wonderful highlights of Istanbul. characteristic features of the landscape are the remarkable conical rock outcroppings know as fairy chimneys. The softness of the tuff made it easy to excavate and create dwellings, so whole cities were constructed underground as well as hundreds of rock-cut chapels, beautifully frescoed churches and monasteries. Lunch will be served at the lovely restaurant serving traditional Turkish cuisine. 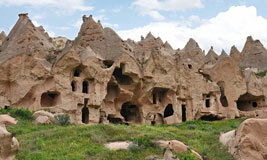 After lunch you will visit the Goreme Open-Air Museum. Goreme Open-Air Museum - The best examples of Byzantine art in Cappadocia in rock-cut churches with frescoes and paintings. Wonderful and primitive 11th- and 12th-century frescoes cover the walls of these churches. The oldest churches in the area date back to the 6th century. 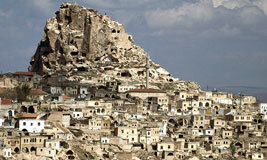 Uchisar - a small town situated right in the middle of Cappadocia, full of towering rock houses typical of this area. It is named after the enormous piece of rock in the center of the town, which was once used as a castle. 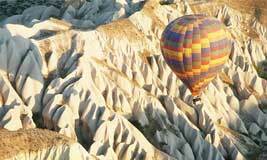 (Optional) Balloon Tour - Get an early start for your optional (extra cost) one-hour hot air balloon flight. This is truly a once-in-a-lifetime experience and there is no better way to see the distinctive landscapes of Cappadocia than by gently floating overhead in a hot air balloon. Your skilled pilot will skim the basket across fruit trees and rise up over the fairy chimneys, before ascending to great heights for breathtaking views. low, narrow and sloping passages. While the city has 8 floor, only 4 of them are open to the public today, in which the spaces are organized around the ventilation shafts. Cavusin - view the lovely village of Cavusin before continuing to Avanos. Avanos - center of terra cotta work of art since 3000 BC. dating back to the Hittite period. 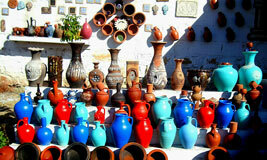 You will have a chance to see how pottery is made in this region. Pasabag Valley - where the formation of "fairy chimneys" can be best observed. Pasabag, the Pasha's Vineyard, is surrounded by incredible natural rock formations-a spectacular scene. Zelve - where three canyons meet in the Valley of Monks. The rock face at Zelve is honeycombed with caves and churches, and much of the decoration inside the churches is symbolic. Bosphorus Cruise - The Bosphorus bisects Istanbul, separating Europe and Asia, and connecting the Black Sea to the Sea of Marmara. Your boat will pass by magnificent palaces, old seaside mansions, and impressive fortresses. You will be surprised to see that the old Ottoman buildings harmonize perfectly with the more modern architecture. Watch for the Imperial Pavilions of Yildiz Palace, the famous Ciragan Palace, the Bosphorus Bridge, Ortakoy, Dolmabahce Palace, Beylerbeyi Palace and the Rumeli Fortress, built to control the Bosphorus and protect Istanbul from its enemies. Later in the afternoon, transfer to your ship. - Egyptian Market is closed on Sunday. Bosphorus Cruise tour can also be organized with private boat.